David came across this recipe in the recipe book I gave him last Christmas and was eager to give it a try. I was particularly interested in the gnudi (pronounced [nudi]), which I discovered are a subset of gnocchi from Florence, made with predominantly ricotta and spinach. The recipe looked to be quite an endeavour, so we found a quiet evening and decided to give it a go. Gnudi: Drain the ricotta in a fine-mesh strainer suspended over a bowl for 30 minutes. In a stand mixer fitted with the paddle attachment, blend the egg, Parmesan, flour, salt, pepper, nutmeg and cayenne until fully combined. Blend in the ricotta and spinach and mix again until smooth. Scoop out 2-tsp portions, dust them with flour until fully coated, and refrigerate until ready to cook (can be made the day ahead). In a medium pan, melt the butter over medium heat. Add the gnudi and sear them until lightly browned all over, 3-4 minutes. Place chicken, onions, minced garlic, carrots, roughly chopped celery, peppercorns, bay leaves, tarragon and thyme sprigs in a soup pot and cover with water. Bring to a boil over high heat, decrease the heat to low, cover, and simmer for 45 minutes. Remove from the heat and let cool briefly. Strain the stock through a fine-mesh sieve and reserve both the stock and the solids. Separate the chicken from the remaining debris, and discard the skin and vegetable solids. Pick the chicken meat from the bones, discard the bones (or use to make stock) and chop the meat somewhat finely. In a heavy soup pot over low heat, melt the butter. Whisk in flour and stir and cook to make a blond roux. As soon as it begins to smell nutty, add the diced onion, finely minced garlic, diced celery and fennel. Increase the heat to medium and cook, stirring constantly, until the vegetables begin to get tender. Add the chicken and stir until well combined. Stir in the vermouth, thyme leaves, and parsley. Add 6 cups of reserved chicken stock and bring to a simmer. After a minute or two, the sauce will begin to thicken. Continue adding stock, ½ cup at a time, until the desired consistency is reached. It should be thick enough to nicely coat the back of a spoon. Season with salt and pepper. 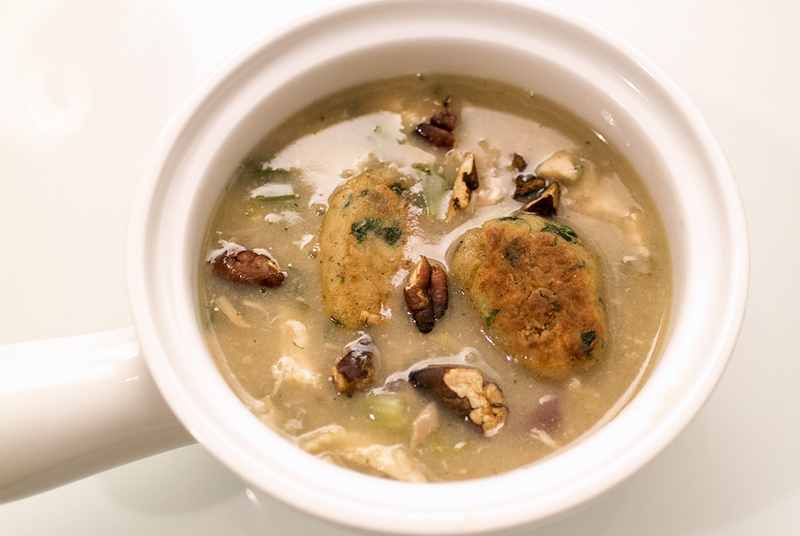 Ladle the stew over top of sautéed gnudi and garnish with chopped tarragon and pecan pieces. A few notes on preparation: David (not reading the recipe carefully enough) accidentally put all of the onion and celery in with the chicken at the same time. So we just used some extra celery and onion to stir into the soup later. The gnudi turned out to be super delicious–a little bit crispy on the outside giving way to a creamy interior. The chicken stew was also very tasty, though it could have been a touch thicker. D noted that while it was fun to make it this way (cooking the entire chicken and then using the broth), he’s not sure that we couldn’t have just made the filling for our chicken pot pie and achieved a very similar effect (for much less effort). It was definitely tasty and also delicious the next day for lunch. We also could definitely see pairing the gnudi with different types of sauces.